When Józef Stalin died on 5 March, all Polish periodicals, including Radio i Świat, acknowledged the Soviet leader’s pre-eminence. 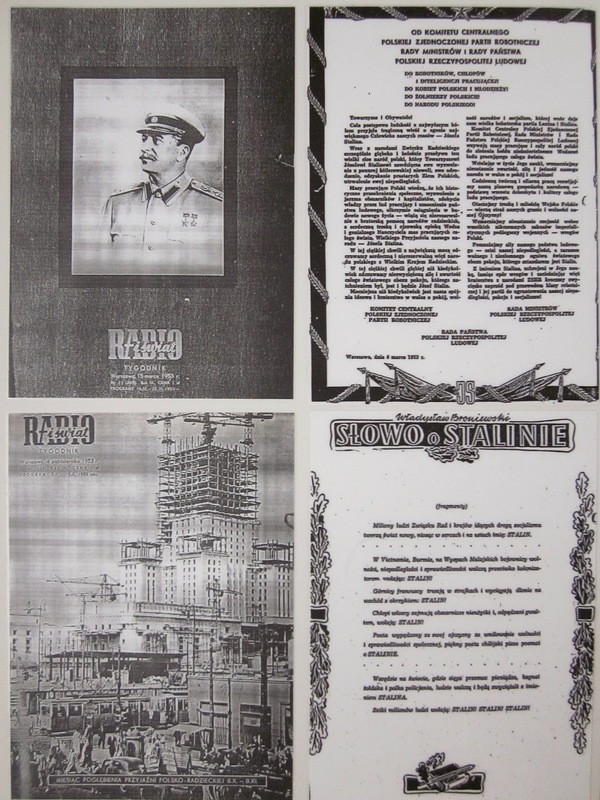 The black-edged photo of Stalin on the cover of Radio i Świat was followed on inside pages by eulogies and articles, including the declaration of the PZPR’s Central Committee and a fragment of an oft-quoted ode to Stalin by the Polish poet, Władysław Bromiewski. The fourth panel above is a photograph taken later in 1953 of Stalin’s ‘gift’ to the Polish people – the Palace of Science and Culture, which still dominates Warsaw’s skyline. Musicians were still occasionally featured in Radio i Świat, although not always in the happiest circumstances. Grzegorz Fitelberg, the musical director of the Great Symphony Orchestra of Polish Radio in Katowice (then called Stalinogród) and the conductor of several Lutosławski compositions, died in June 1953. He is pictured earlier in his career (top left) with his great friends, the composer Karol Szymanowski and the violinist Paweł Kochański. 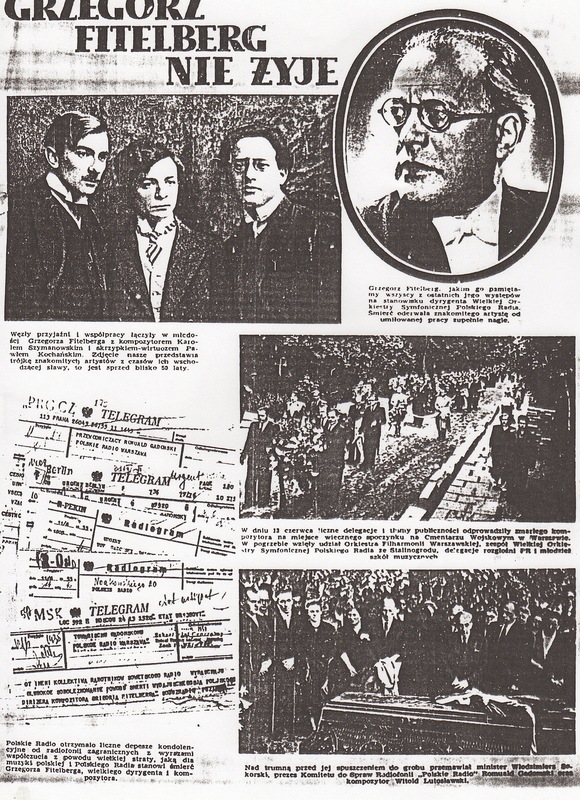 Lutosławski, who regarded Fitelberg as a mentor, may be seen (bottom right) at his funeral, standing fifth from the left in the front row, with coat over his arm. Although the period of intense Stalinist interference in Polish culture began to wane after his death, the mass song still had a function. From late 1953, overtly political sentiments were gradually replaced by folksongs or less controversial topics like sport or the increasing ease of life in Warsaw’s restored streets and squares. Songs were still required, however, for the armed forces, and in 1953 Lutosławski composed three soldiers’ songs. Two of them (jaunty krakowiaks like Służba Polsce) were published in Radio i Świat n April and June 1954 and broadcast on Polish Radio. Reflecting the changing atmosphere, Kto pierwszy (Who is going first) is about flirting, not fighting. While there were publishing outlets in organisations like the Ministry of Defence and the ZMP (Polish Youth Union), the central coordinator was PWM (Polish Music Publishers). 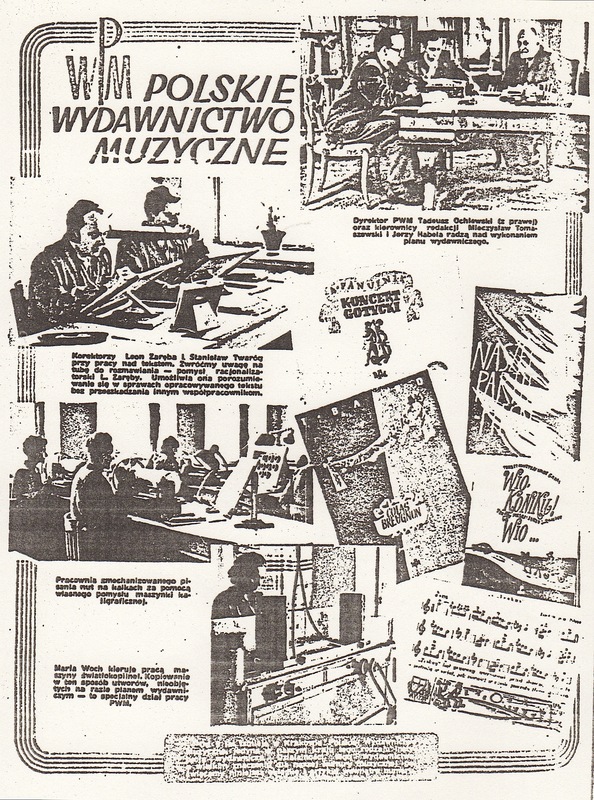 PWM published many mass songs as well as all Polish concert music. It had early on established excellent editorial and technical standards. The music covers featured in this Radio i Świat profile (April 1954) avoid concert pieces (plain brown covers), highlighting instead graphic designs for folk and children’s music and pastiche compositions (Baird’s Colas Breugnon and Panufnik’s Gothic Concerto). Within months, Panufnik was persona non grata in Poland, having fled to England to escape pressures from the Party. Also visible is the mass-song collection Naszej Partii Pieśń (Our Party Song), a reminder that the PZPR still had cultural clout. 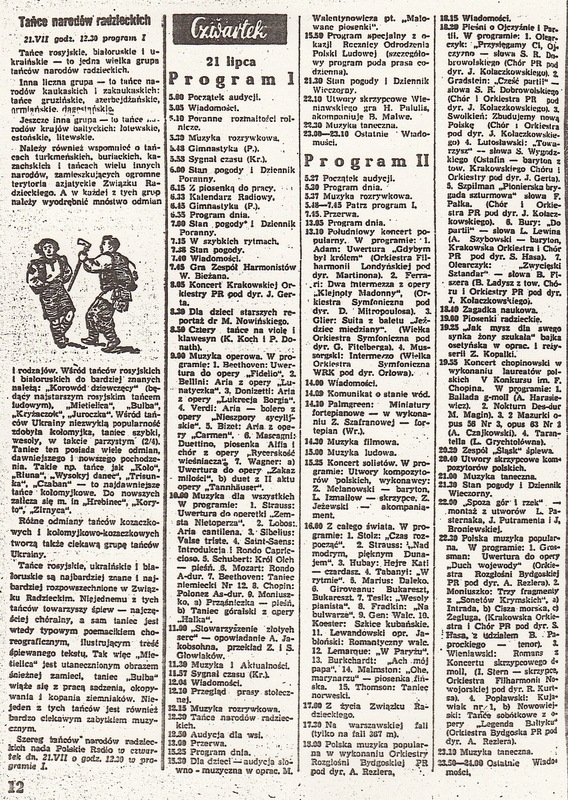 It is surprising to find a mass-song programme – ‘Songs of the Fatherland and the Party’ – being given detailed billing in the Radio i Świat listings as late as 21 July 1955 [22 July each year, however, was a key date for the Party]. 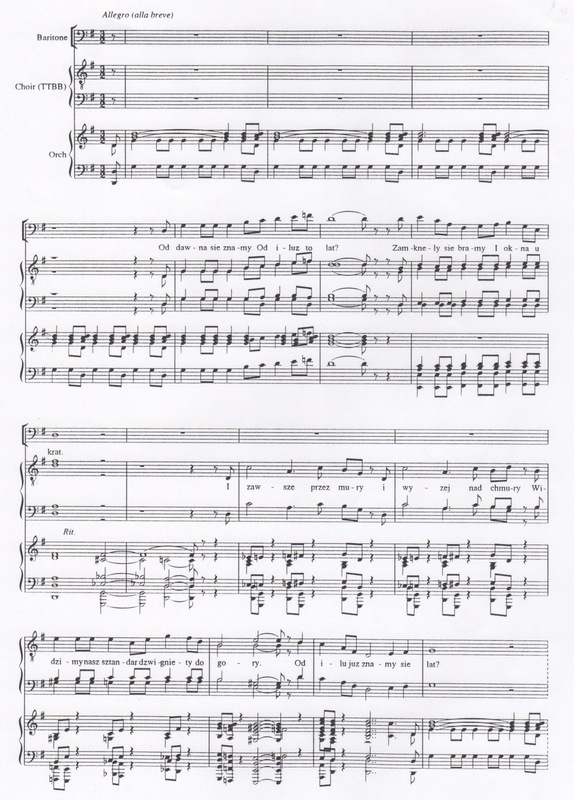 Lutosławski’s unpublished Towarzysz (Comrade) is one of the seven songs included. The gates, windows and grilles are closed. We see our flag raised on high. For how many years have we known each other? But the word comrade went around the world. We see our flag flying over us. And the red flag is victorious. For so many years we have known each other. From time to time, Radio i Świat published interviews with composers and performers. 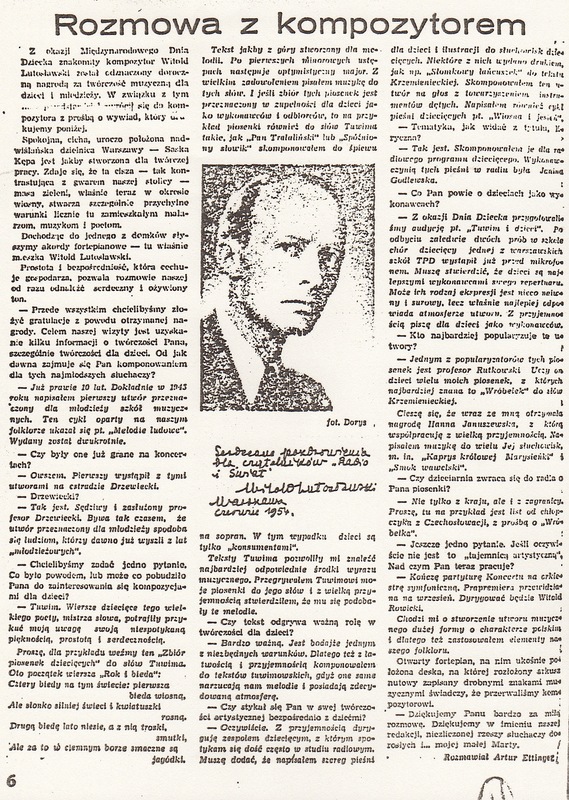 When Panufnik was interviewed in Debruary 1951, he fell into line by praising socialist-realist music he had heard on a recent conducting trip to Hungary. Lutosławski’s interview three years later was characteristically (and more easily) circumspect. He talked almost exclusively about his love of music for children, mentioning only in passing his just-finished score for the Concerto for Orchestra. The hand-written message reads: ‘Warm regards to the readers of Radio i Świat‘, Witold Lutosławski, Warsaw, June 1954’. 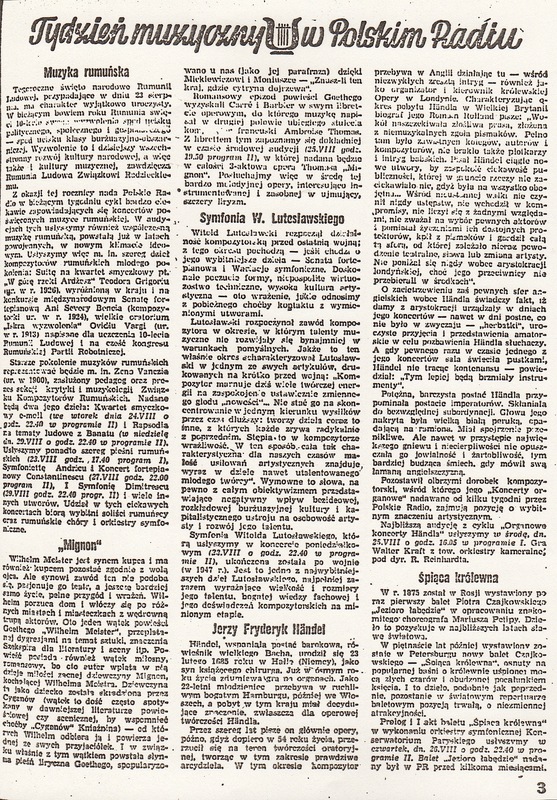 Radio i Świat‘s principal music column (from August 1951) was ‘Tydzień muzyczcny w Polskim Radiu’ (The Musical Week on Polish Radio). Along with programme listings, it reveals that we probably need to revise our understanding of which music was or was not heard during the early 1950s. Panufnik’s Sinfonia rustica, for example, was ‘banned’ in 1949, but turns up in the broadcast schedules for 18 April 1950 and 1 April 1953, less than a month after the death of Stalin. Two other symphonies, Turski’s Olympic Symphony and Lutosławski’s First Symphony, both also proscribed in 1949 and supposedly not heard again until the late 1950s, turn up in a special Polish Radio series (1954) celebrating the best Polish symphonies of the first ten years of the Polish Peoples’ Republic. Lutosławski’s symphony, performed by the Great Polish Radio Symphony Orchestra and conducted by Witold Rowicki, was broadcast on 23 August 1954 and again on 2 July 1956. Undoubtedly one of the greatest signals that Polish musical culture was changing was the publication of music that had religious or foreign connections. 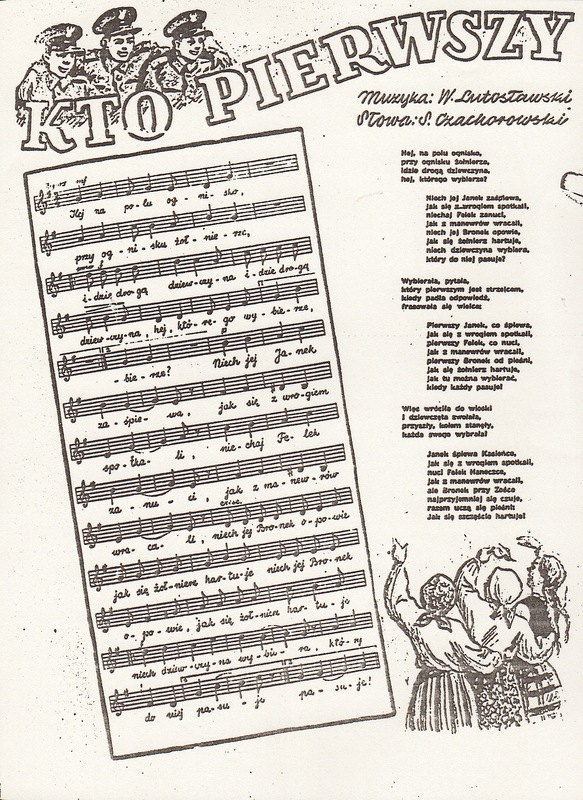 The front inside-cover of Radio i Świat at Christmas 1956 published the early carol My też pastuszkowie, the first such acknowledgment of Christmas in Radio i Świat since the 1947 broadcast of Bethlehem Stars. 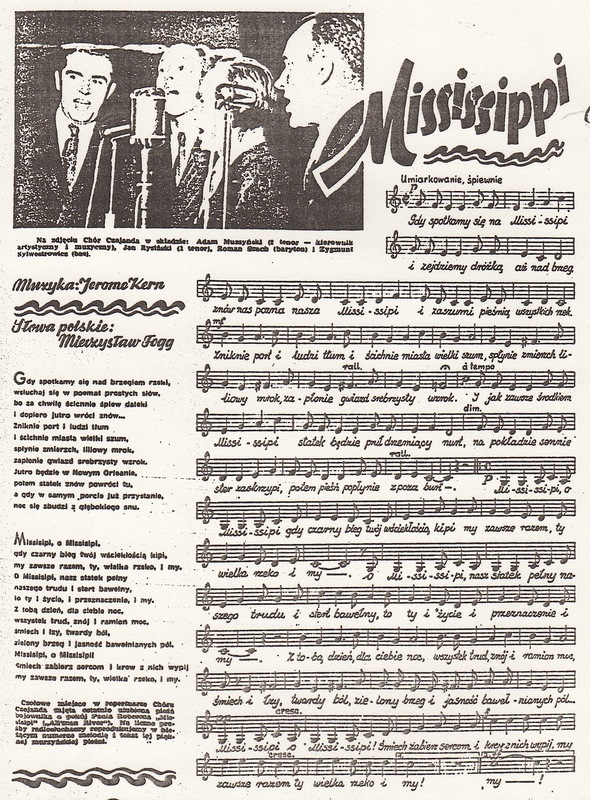 But as early as March 1954 (just before Lutosławski’s Kto pierwszy appeared) there is a full inside-cover spread devoted to Mississippi (Ol’ Man River). This probably crept in because of its link with the American singer Paul Robeson (‘champion of peace’), who had made highly public ‘fraternal’ visits to Poland and the USSR a few years earlier. Mississippi was followed in 1955 by songs by Honegger and Auric and by the Yves Montand song C’est si bon and Donaldson’s Hawaiian Lullaby in October that same year. 1956 witnessed the publication in Radio i Świat of Gershwin’s Summertime and I Got Plenty o’ Nuttin’, by which time the Polish mass song had given way almost entirely to popular foxtrots, tangos and waltzes.